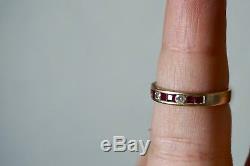 Vintage Ruby And Diamond Ring In 14K Gold With Simple Band / Mens Rings / Accessories / Vintage Rings / Retro Jewelry / Diamond And Ruby. Reminds us of the Queen Of Hearts from Alice In Wonderland, this ring is simple and stunning, featuring diamond and rubies in a simple streamlined 14k gold band, it's a great accent piece or on it's on. 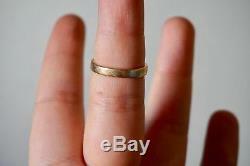 In good vintage condition, some scratches, could stand with a polish. 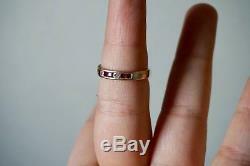 Measures 17mm opening, 3mm wide band, with 6 rubies and 2 diamonds about a 6 1/2-7 size. We feature expertly curated vintage clothing and accessories with great taste! Our vintage items have stood the test of time and some signs of love and time should be expected, major issues will always be stated. We thoroughly guarantee a memorable guest experience and fine vintage for you and company to relish for years and years. The item "Vintage Ruby And Diamond Ring In 14K Gold With Simple Band / Mens Rings / Access" is in sale since Wednesday, February 14, 2018. This item is in the category "Jewelry & Watches\Fine Jewelry\Fine Rings\Gemstone". 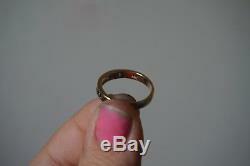 The seller is "newandoldallgold" and is located in North Hollywood, California. This item can be shipped to United States, Canada, United Kingdom, Denmark, Romania, Slovakia, Bulgaria, Czech republic, Finland, Hungary, Latvia, Lithuania, Malta, Estonia, Australia, Greece, Portugal, Cyprus, Slovenia, Japan, Sweden, South Korea, Indonesia, Taiwan, Thailand, Belgium, France, Hong Kong, Ireland, Netherlands, Poland, Spain, Italy, Germany, Austria, Israel, Mexico, New Zealand, Philippines, Singapore, Norway, Saudi arabia, United arab emirates, Qatar, Kuwait, Bahrain, Croatia, Malaysia, Chile, Colombia, Costa rica, Antigua and barbuda, Aruba, Belize, Dominica, Grenada, Saint kitts and nevis, Saint lucia, Montserrat, Turks and caicos islands, Barbados, Bangladesh, Bermuda, Brunei darussalam, Bolivia, Ecuador, Egypt, French guiana, Guernsey, Gibraltar, Guadeloupe, Iceland, Jersey, Jordan, Cambodia, Cayman islands, Liechtenstein, Sri lanka, Luxembourg, Monaco, Macao, Martinique, Maldives, Nicaragua, Oman, Pakistan, Paraguay, Reunion.